This summer’s been hot. (Don’t worry Toronto, we’ll be back in the 30’s again by this weekend.) That’s my reason for consuming an untold amount of ice cream sandwiches. The box in the freezer keeps spontaneously regenerating them – a bottomless pit of cheap and cheerful frozen delight. But can a girl live on ice cream sandwiches alone? Surely there must be something tastier (and more special) out there that would keep me cool and still keep my waistline inching outward? Since the start of our gloriously blistering summer, the only recipes that my brain has been acknowledging are the ones that are frozen, sweet, and have an above average butterfat content. I’m not going to fight it; I decide to make some cool treats of my own. I pick two recipes to try. I’m excited. And then I’m not. They both fail miserably. One was so much work and the other one less so but both outcomes were really annoying. I consoled myself by eating an ice cream sandwich. These two failures sat in my freezer for weeks. I didn’t want to deal with them. But every time I opened my freezer door to reach in for an ice cream sandwich, I was confronted by their hulking glacial masses. This couldn’t be the beginning and end of my attempt, so I threw them out, picked myself up and decided to try again. But this time I would do as an Italian would. This is a good rule of thumb and one I use when I hit a cooking obstacle. An Italian wouldn’t overthink it, which is why I think the other recipes failed. 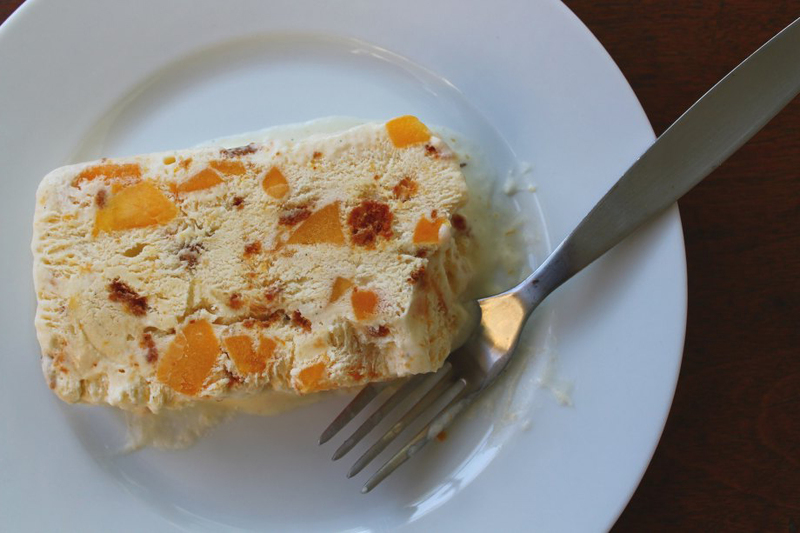 If an Italian wanted to make a frozen confection, they’d make a semifreddo. The flavours aren’t mucked about with and the ingredient list is simple. You don’t need much skill, just a mixer with a whisk really. But be warned, you will sully a few bowls while making this. 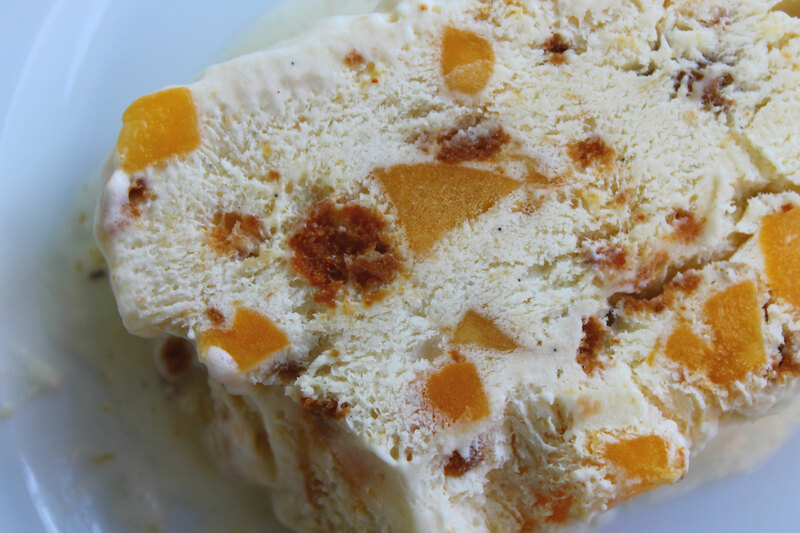 Ontario peaches are in season and with the thought of making a semifreddo obsessing me, I serendipitously came across a peaches and cream semifreddo recipe on The Kitchn. 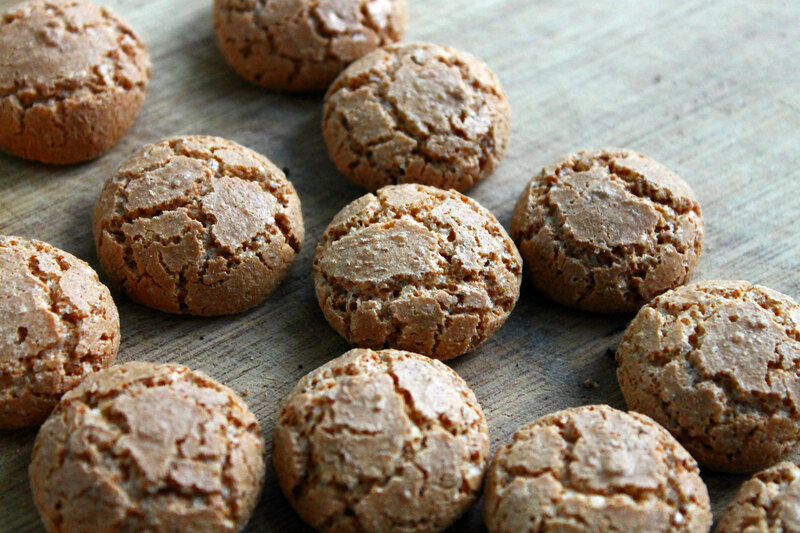 My only amendment was to add crushed amaretti cookies, an Italian almond cookie that is a perfect match for a peach. This dessert tastes as good as it looks. That creamy expanse is flecked with vanilla and bejeweled with bright summer peaches. The amaretti give the semifreddo a bit of crunch here and there with that sweet, almost burnt sugar almond taste. This is a bit of an upgrade from your standard ice cream sandwich. 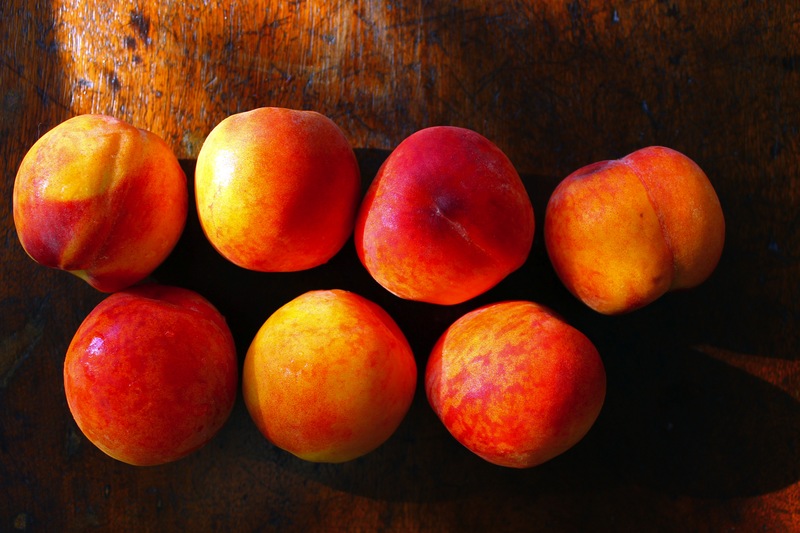 *check out my post on Peachy Keen Mess to find out how to skin peaches. **in Canada, a cream with at least 30% butterfat is whipping cream. I believe this cream goes by other names in other places. So, just check the butterfat content. You need your cream to have at least 30% butterfat in order to whip it into stiff peaks or else you’ll exhaust yourself and only get a flaccid frothy cream. 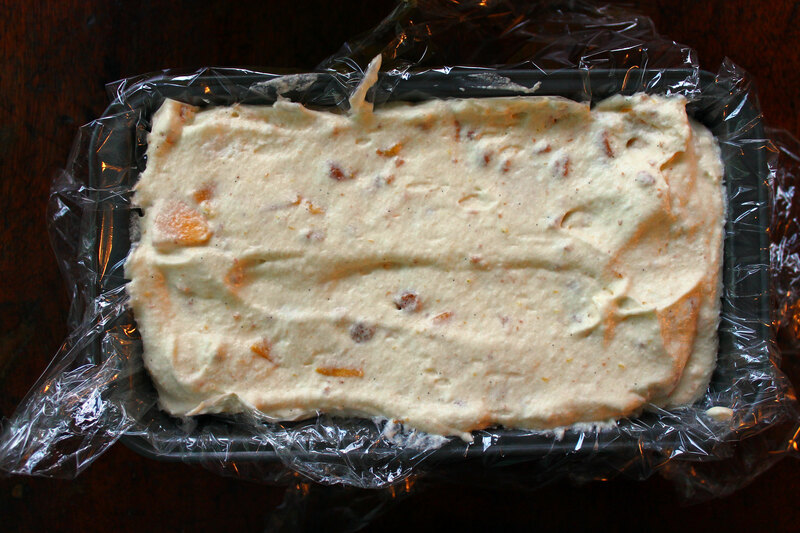 Line a loaf pan with plastic wrap, letting excess drape over the sides. Try andsmooth out the bottom and the sides as much as possible so your semifreddo won’t come out wrinkly. 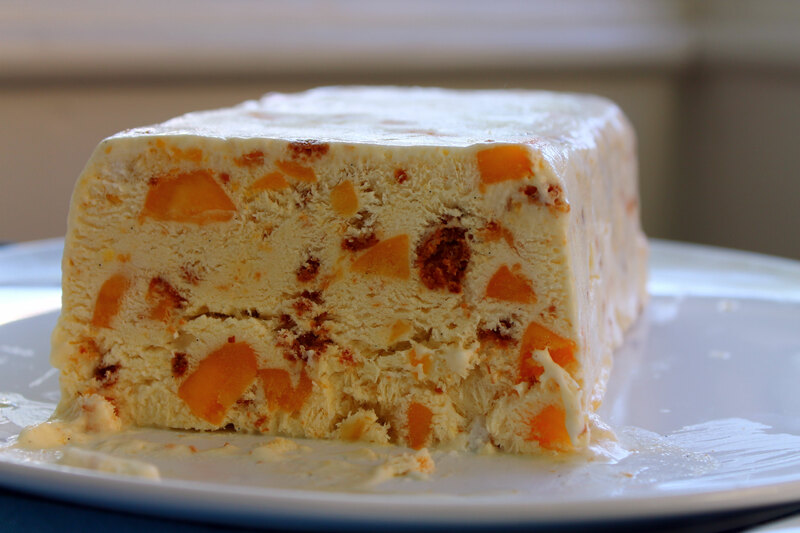 But don’t worry about it too much – you can always smooth out your semifreddo with a warm offset spatula or knife. In the bowl of a stand mixer fitted with the whisk attachment, whip the cream on medium speed until stiff peaks have formed. Transfer to another bowl and pop in the fridge to chill. Slice open the vanilla bean and scrape out the seeds within. Clean the bowl and whisk attachment. Add the egg yolks, vanilla bean seeds, vanilla extract, and 1/3 cup sugar. Beat on high speed until pale and fluffy, about 3 minutes. Transfer to a large mixing bowl and set aside. You’re going to use this bowl with the egg yolks to mix everything together. Clean the bowl and whisk attachment again. Add the egg whites and mix on medium speed until frothy, about 1 minute. Increase speed to high. Slowly add sugar. Continue beating until stiff peaks have formed, about 4 minutes. 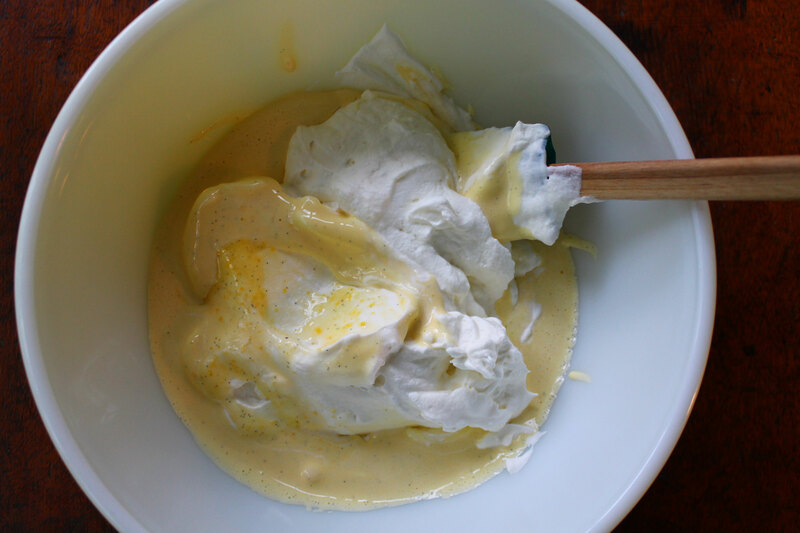 Fold the chilled whipped cream into the egg yolk mixture. Gently fold in the egg whites, a third at a time. 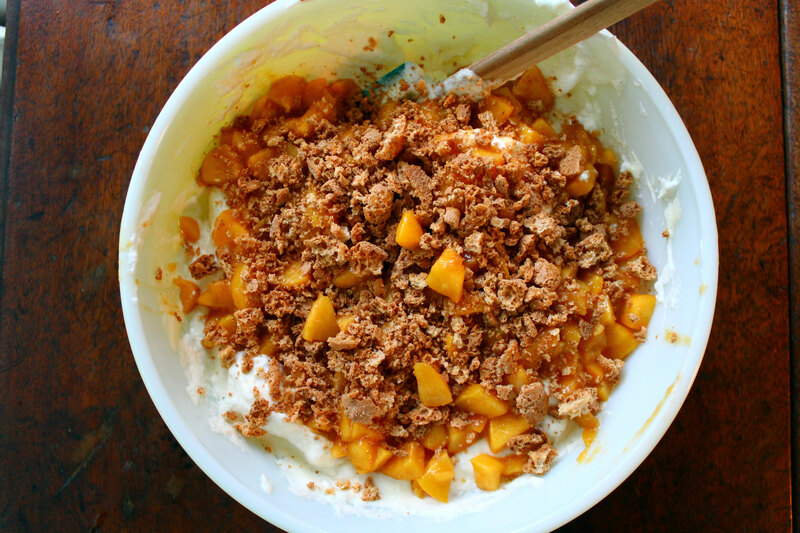 Before adding and folding in the last third of the egg whites, add the diced peaches and the crushed amaretti cookies. Once all your ingredients are in the bowl, gingerly fold it all together until everything is well incorporated but be careful not to deflate the mixture. When doing all this folding, don’t rush and beat the mixture. It might not look like it’s coming together but it will. Spoon the mixture into the prepared loaf pan. Spread evenly with a spatula, and cover with another piece of plastic wrap, smoothing out any wrinkles with your hands. Tuck excess plastic wrap over the top. Freeze until firm, at least 8 hours but preferably overnight (and up to a week). To serve, invert semifreddo onto a serving platter and remove pan and plastic wrap. Let stand 10 – 15 minutes at room temperature to soften. Depending on the warmth of your kitchen, I’d say 15 minutes is better. No matter how hard you try for the plastic wrap to be smooth, you probably will still have a few wrinkles in the surface of the semifreddo. No worries. Run a knife under some warm water and then smooth the top and sides. Or you can bypass all of this and just defrost the semifreddo in the pan and then scoop it like ice cream. It’s the end of February and this looks so refreshing and delicious. I can’t wait to try it.